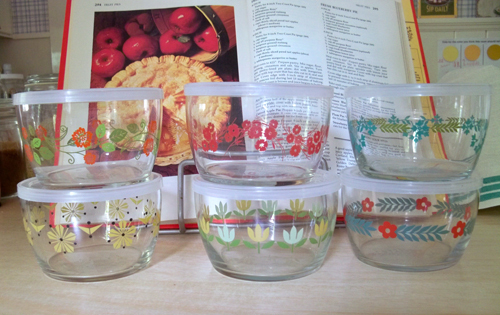 We have been using glass containers for lunches and leftovers for awhile now. We needed some more so I was thrilled when I saw these at Fishes Eddy AND they had cute patterns on them. They look vintage, I think. My mom just scored one of these As Seen on TV Smart Spin Storage Systems for me also and I am enjoying the "slide, spin and store" action. Love them, they feel like old soda shop glasses. My storage containers are next.